Enjoy martins frolicking and colonizing in your backyard by placing this Heath 12-Room Two-Story Purple Martin House and Gourds Package in it. This fantastic kit offers a wealth of housing options to purple martins, which are fully dependent upon manmade shelters. The Heath Two-Story Purple Martin House is a fantastic home for any beginning landlord, thanks to its all plastic body and snap assembly. Each floor has 6 individual apartments, measuring 5.75" long and 5.75" wide, and the 2.125" diameter entry for each apartment allows martins to easily access it. The deep green color of the roof, chimney, and bases lend striking contrast to the white body of the piece, and perches sit in front of each opening for convenient landing spots. Slide the included Heath Telescoping Gourd Pole Kit through this structure for stability and strength, and to offer martins even more housing options. Predrilled holes on the pole accommodate the included rods, and allow you to easily hang the four Heath Two-Piece Martin Gourds. These ivory colored, plastic gourds each sport a crescent shaped entry, keeping starlings from using them, as well as a canopy over the opening to protect nestlings from rain. The plastic body and light color keep these units cool in the summer, and slots on the base ensure drainage. Adding these gourds allows you to increase the size of your colony, and provides your feathered friends plenty of roosting options. To better attract martins, attach the two Heath Deluxe Purple Martin Decoys to the house or gourds, and secure them with their included base clamps. 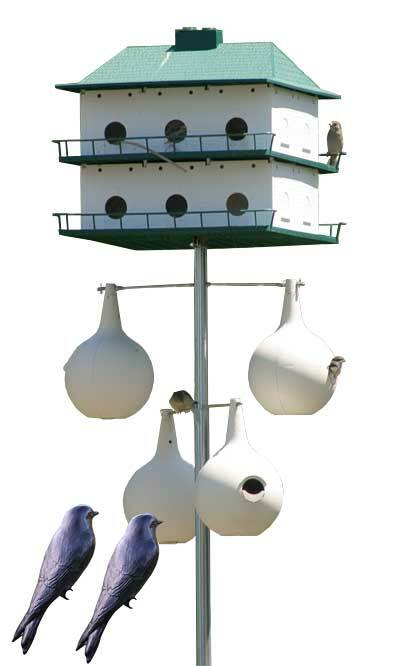 Help martins thrive by offering them several roosting spots with this Heath 12-Room Two-Story Purple Martin House and Gourds Package. House, gourds, and pole made in the USA.